Tri Hita Karana is a Balinese Hindu philosophy that posits health, happiness, and prosperity are achieved by living harmoniously with God and the spiritual world. “Tri” refers to three, “Hita” means happiness, and “Karana” translates to causes. Tri Hita Karana translates to “Three ways to achieve spiritual and physical well-being.” According to the Tri Hita Karana doctrine, spiritual and physical well-being is only possible through peaceful relationships among humans, peaceful relationships between humans and the environment, and a harmonious relationship with God. This principle is imbued at the Ubud Sacred Monkey Forest Sanctuary. 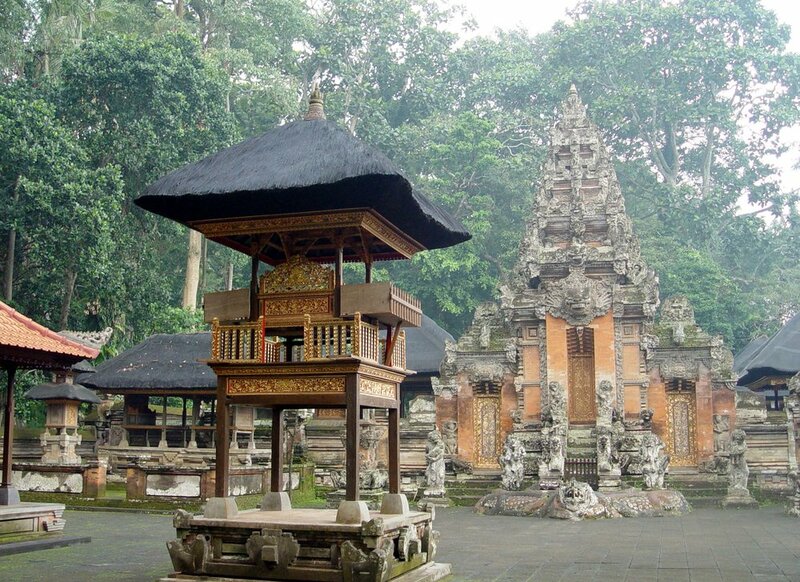 On a daily basis the Balinese worship at the temples and alters in the monkey forest and provide offerings to the gods. The monkey forest is considered sacred among the Balinese people, as are the macaques that live at forest. The importance of Tri Hita Karana is also demonstrated in two important ceremonies, Tempek Kadang and Tempek Uduh. Tempek Kadang is a celebration dedicated to animals, and the macaques at the forest are given a variety of fruits and eggs. The celebration emphasizes that people should protect animals and provide them with good lives. Tempek Uduh celebrates plants and emphasizes the conservation of their landscapes. The Ubud Sacred Monkey Forest Sanctuary is home for >700 long-tailed macaques (Macaca fascicularis) who live in six social groups. Long-tailed macaques are also known as crab-eating or cynomolgus macaques. Long-tailed macaques inhabit a variety of ecologies and are found from Myanmar to the Philippines, and thrive in undisturbed forests and cities. Long-tailed macaques can live among people because they are highly intelligent and display a wide degree of behavioral plasticity. Long-tailed macaques are also dietary generalists who consume many types of wild plants and happily eat human crops and processed foods when given the opportunity. The long-tailed macaques at the Ubud Sacred Monkey Forest Sanctuary are provisioned with sweet potatoes, bananas, papaya leaves, and naturally occurring fruits and vegetables. These macaques are also completely habituated to humans and interact with the forest staff and tourists who visit the forest. The macaques are managed by the Ubud Sacred Monkey Forest Sanctuary temple staff for the safety of the macaques, the local Balinese, and the visiting tourists.